We Delhiites love to read newspapers; especially if the pages are sprinkled with steamy hot pictures of Hollywood celebrities announcing their weddings and birthdays! (pun intended). Last week, both Times of India (TOI) and Hindustan Times (HT) published Indian Readership Survey (IRS) data, molded as per their convenience. Hindustan Times was not left behind with their classic title: “Delhi votes for HT yet again”. In India’s 8 largest cities (with population of more than 5 million), TOI has a readership of 5.2 million, compared to 2.7 million for HT and 0.8 million for Hindu. Every three months these newspapers publish these IRS results to attract more readers and importantly, more advertisers. The most interesting aspect of these self-promotional stories is that, each publication comfortably adapts the data based on their convenience, while ignoring things that go against them. In short, it is the war of the words out there to capture to the multi-million dollar advertising market inside India, which is growing at a fast pace. Internet (24.2 percent) and Cinema (11.6 percent) were the 2 verticals that saw maximum increase in consumption between Q2 2012 to Q4 2012, while the print media witnessed slowest growth (0.8 percent) during same period. mobile we users growing at breakneck speed, media consumption on internet is expected to get popular even more popular, while print media’s market share is going to erode slowly! In Western markets, internet has already overtaken print media, and India will probably get there in a few years! 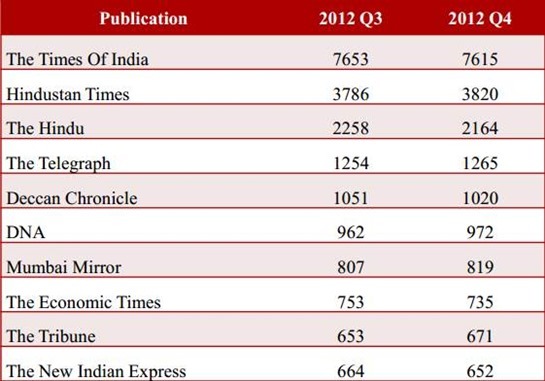 It is interesting that in Top 10 publications chart, there is only one English publication (Times of India). 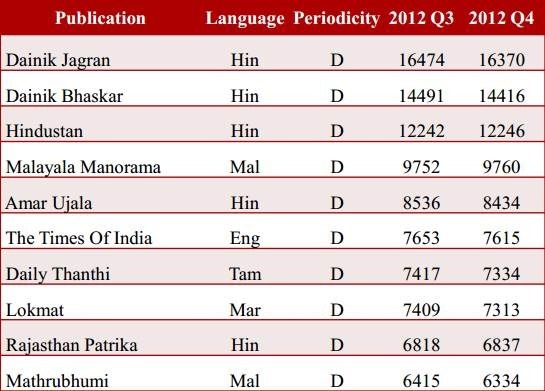 4 out of the top 5 The top publications are in Hindi language. You can find the complete research data here. So, which is your favorite newspaper? Which magazine you can’t absolutely live without? Does these data and statistics resonate with your personal preferences? Please feel free to share your views over here!